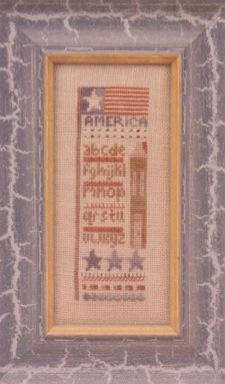 Description: Americana Sampler was designed to teach on a second appearance to the Orange Coast Sampler Guild. This kit includes 32 count Summer Khaki Belfast linen by Zweigart from Norden Crafts, hand-dyed fibers from Weeks Dye Works and The Gentle Art, chart and tapestry needle. This design is stitched over one linen thread. Specialty stitches include four-sided stitch, long arm cross, blanket stitch, horizontal elongated smyrna, cross rhodes, checker stitch and hemstitching. Ours is framed in an Olde Colonial Designs frame (PR1537). 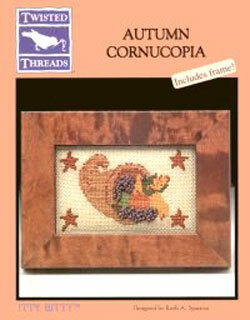 Description: Autumn Cornucopia will make this Autumn series complete with Autumn Acorn and Autumn Pumpkin. This design comes with the itty bitty burl frame from Olde Colonial Designs. It is stitched on 32-count Natural Light linen from Wichelt Imports, Inc. with Weeks Dye Works and Anchor floss. 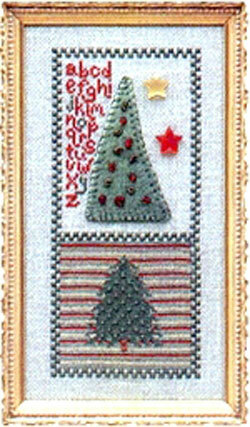 All cross stitch is done over one linen thread with one strand of floss. Description: Kit includes 32 count Smokey Pearl Zweigart Belfast from Norden Crafts and Sampler Threads from The Gentle Art. 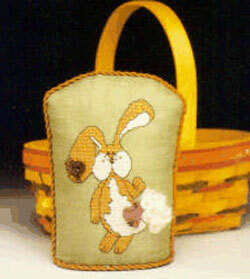 All cross stitch is done over one linen thread with one strand of floss. Smyrna Cross is used in the heart. We framed ours in a fluted star tin frame (TF06) from Twisted Threads. 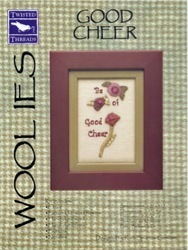 Description: Kit includes 32 count Laurel (65-141) linen from Wichelt Imports, Inc., Gentle Arts Sampler Threads, Woollies from The Thread Gatherer, buttons from Just Another Button Company, tapestry needle. Stitched over 2 linen threads. 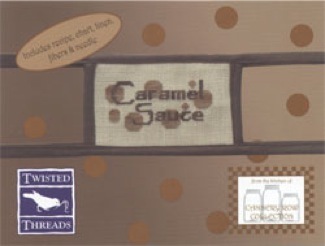 Description: Kit includes 32 count Sand Belfast linen by Zweigart from Norden Crafts, Sampler Threads from The Gentle Art, directions on finishing and a great recipe for barbecue sauce! Kitted in a canning jar to get you started - as this is a great gift for friends and family! Description: Kit includes 32 count Sand Belfast linen by Zweigart from Norden Crafts, Weeks Dye Works, directions on finishing and a great recipe for caramel sauce! Kitted in a canning jar to get you started - as this is a great gift for friends and family! 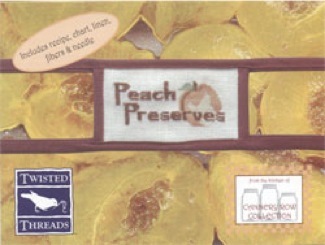 Description: Kit includes 32 count Baby Lotion Belfast linen by Zweigart from Norden Crafts, Sampler Threads from The Gentle Art, directions on finishing and a great recipe for peach preserves! Kitted in a canning jar to get you started - as this is a great gift for friends and family! Description: Kit includes 32 count Olive Green Zweigart Belfast from Norden Crafts and Sampler Threads from The Gentle Art. 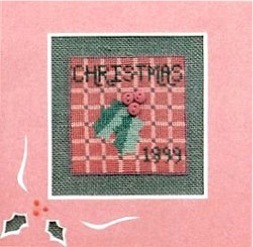 All cross stitch is done over one linen thread with one strand of floss. We framed ours in a fluted star tin frame (TF06) from Twisted Threads. Description: Kit includes chart, hand-dyed wool, hand-dyed floss, buttons and needles. Good Cheer is stitched on 32 count Putty Belfast linen by Zweigart from Norden Crafts with one strand of Sampler Threads over one linen thread. There are 2 needles included with this kit. The tapestry needle (blunt point) is used for the cross stitching and the crewel needle (sharp point) is used for blanket stitching the wool to the linen. 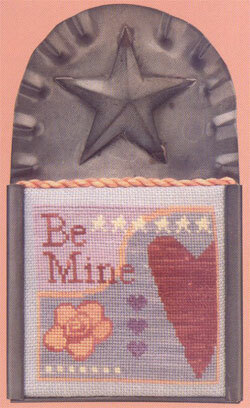 We have also included instructions for doing the blanket stitch. The double frame is from East Side Mouldings: 3300SA/3100WN 4-1/2 x 6-1/2. Description: 32 count Olive Green Belfast by Zweigart from Norden Crafts with one strand of Anchor floss stitched over one linen thread. Kit includes hand-dyed wool, hand-dyed silk from The Thread Gatherer and 2 Mill Hill Glass Treasures. Description: Stitched on 32 count Light Mocha Belfast by Zweigart from Norden Crafts with one strand of Anchor floss over one linen thread. Our border is the four-sided stitch. 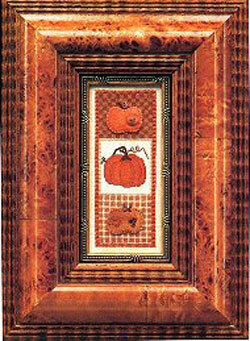 This design includes the frame from Olde Colonial Designs. 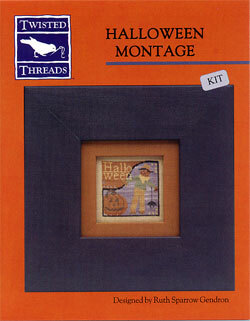 Description: Kit includes hand-cut mat from Bowman's Framing and 3 hand-made clay buttons from Button Frenzy. Stitched over one linen thread on 32 count Dark Teal Green Belfast linen by Zweigart from Norden Crafts with Anchor floss. We framed ours in an Eggplant frame from East Side Mouldings. 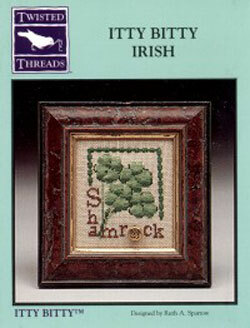 Description: This little shamrock design is perfect for anyone who has a bit of Irish in them. Stitched on 32 count Clay Belfast by Zweigart from Norden Crafts with Anchor floss over one linen thread, this design comes with the frame from Olde Colonial Designs and the celtic charm. 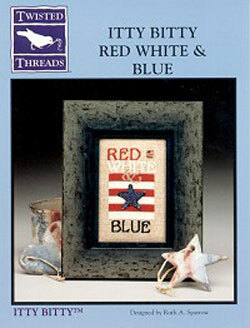 Description: We love patriotic designs! 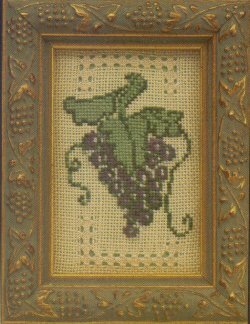 This one is stitched on 32 count Natural Belfast linen by Zweigart from Norden Crafts, ltd. with one strand of Anchor floss over one linen thread. 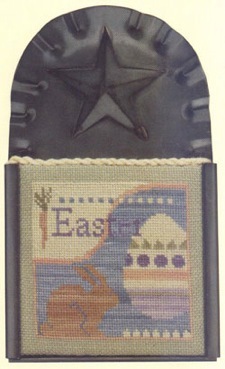 Kit includes the exclusive folk art flag button from Just Another Button Company and the hand-dyed wool to create the star, which is blanket-stitched to the design. 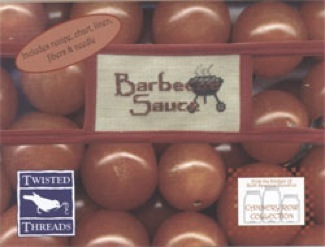 Description: 32 count Natural Glenshee from The Heart's Content. One strand of Anchor floss over one linen thread. Frame from Olde Colonial Designs. Kit includes hand-dyed wool, hand-dyed silk and 4 handmade clay buttons.